After patiently and expensively pulling out all the stops for a year trying to get pregnant, my friends Stephanie and Lance reluctantly put aside their hopes and faced the fact that they were probably never going to be biological parents. Imagine how exacted we all were, not to mention how excited they were, when they found out a few months later they were pregnant! I think we all held our breath through the first trimester with them and I know for a fact there were a multitude of prayers and hopes that all would go well for both Stephanie and little Mr. Ryker--and it did. We all grateful and so happy for Steph and Lance, and to have baby Ryker here. Stephanie works in our NICU so she's seen all the wild hats I've made these past four years and the only thing she asked me out right for was a football hat. I'll blog that later but for now, I'll share the other project with you. How could I not mark such a miracle with something extra special? The outfit is knitted in a super soft light weight undyed alpaca yarn imported from Peru. I added a small coordinating pocket and button on the left chest. The two changes I made were adding elastifc and elimating the drawstring and adding a coordinating pocket on right leg with button to match the hoodie. After several days of watching the yarn sit on the rock with nothing to do, finally yesterday the birds/squirrels found it and made off with it! Yay! It worked. 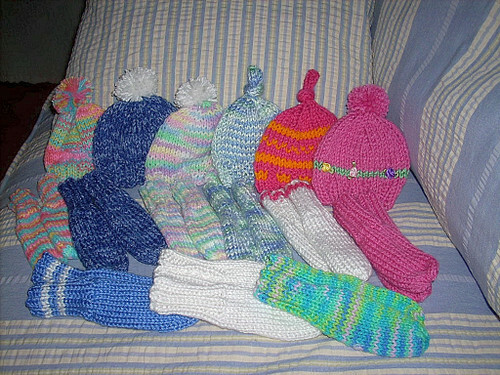 I have more yarn and will be doling out until it's gone. 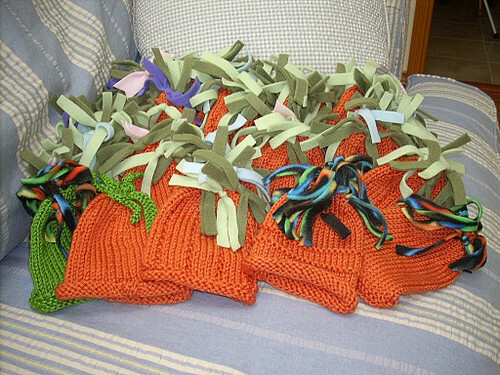 I love the thought of little creature nests lined with the odds and ends of our NICU babies' hats and booties!